Issue badges provide bite-sized sequences of content on different education topics. You earn an issue badge when you have completed the list of requirements for that badge, which might include a watching a video, reading a publication, or taking action through signing a pledge. DISCLAIMER: Action Academy badges measure and recognize your engagement with content designed to make you an informed education advocate. Badges are NOT meant to certify specific skills or achievements. Personalized learning tailors instruction to students’ unique strengths and needs while engaging them in challenging, standards-based academic content. This student-centered approach to teaching and learning helps all students—including those from low-income families and those of color who traditionally have been underserved—develop the knowledge, skills, and abilities that will prepare them for college, a career, and life. Visit all4ed.org/issues/personalized-learning/ to watch additional videos and read school and district profiles about personalized learning in action. Linked Learning is an approach to education that transforms the traditional high school experience for all students—particularly students of color and low-income students—by bringing together strong academics, career-based classroom learning, and real-world workplace experience to help ready them for both college and career. Start earning your Linked Learning badge and learn more about how Linked Learning can improve student learning by completing the steps below. Remember, be sure to login to your account or create a new account if you don’t already have one. Visit the “Getting Started” page to learn more. The Every Student Succeeds Act (ESSA) of 2015 is the latest reauthorization of the Elementary and Secondary Education Act, the primary federal K–12 education law. ESSA provides support to high schools where one-third or more of students do not graduate and schools with groups of traditionally underserved students who consistently demonstrate low performance. The law requires states to report data on student achievement and high school graduation rates and act in response to that data. Start earning your ESSA badge and learn more about the requirements and opportunities in the law by completing the steps below. Visit all4ed.org/essa to view additional fact sheets and videos. Deeper learning is simply what highly effective educators have always provided: the delivery of rich core content to students in innovative ways that allow them to learn and then apply what they have learned. What does deeper learning look like and how does it benefit students? The Common Core State Standards have been adopted by forty-five states and the District of Columbia. Learn more about what they are and how they will improve student learning. In a global economy, U.S. students compete against peers from other countries around the world, and unfortunately, they often come up short. Learn how U.S. students perform internationally and why improving their performance is critical to the future of the country. Many of America’s high schools were designed for an era long since passed. What does it take to successfully improve the high school experience so that students are prepared for a twenty-first-century economy? Nationally, more than 5,000 students drop out of school every day. What are the costs to society of these dropouts, and what would the impact be if more students were to graduate from high school? Explore our content on the Common Core state standards! The Core of the Matter blog series explores the implementation of the Common Core State Standards and the implications for struggling students. Share and comment on this content to spread the word! What’s the role of the federal government in education? What are the ways federal government has influenced education in the United States? This video series will take you on a journey through American educational history. 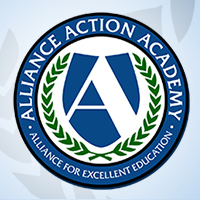 This is the first badge that everyone earns upon signing up for the Action Academy. Welcome and congratulations! The Thumbs Up badge is awarded for rating at least five items on the all4ed.org website. We love feedback! Earn the Social badge for sharing Action Academy content on social media five times! We “like” you for this! And you’re off! You’ve earned your first three badges! The Socialite badge is awarded to those who share content on social media ten times. We really “like” you now! The Commenter badge represents your commitment to the conversation by commenting on five different items. Wow! You’ve earned your first 6 badges, which means you now have seven badges! Get your popcorn ready! This badge is awarded to individuals who watch at least three live webinars. This badge is awarded to those who watch five Action Academy videos. Thanks for viewing! This badge is awarded to individuals who add their name to at least three of the Action Academy’s petitions or pledges. The Super User badge is reserved for individuals who make ten different visits to the Action Academy. Thanks for sticking with us! This badge is for individuals who have watched eight webinars, either live or archived. Take a bow, because you’ve earned ten badges! Keep going! Share an approved story from your classroom or community.